After her divorce, and having not been on the dating scene for some time, Lauren (Drew Barrymore) was set up on a blind date with Jim (Adam Sandler). It went horribly. The first red flag was that he took her to Hooters, where the waitresses fawned over him, and he spent the whole date staring at the game on the television. In his defense, Jim had not been on a date in a long time himself. Jim hasn’t quite figured out how to be a father to his 3 daughters, Hilary (Bella Thorne), Espn (Emma Fuhrmann), and Lou (Alyvia Alyn Lind). He calls his oldest Larry, and he named his second daughter after his favorite network. All the girls go to Jim’s barber for their less than flattering haircuts. And “Larry” is humiliated by the fact that everyone constantly mistakes her for a boy. Lauren has her hands full with 2 boys of her own: hyperactive Tyler (Kyle Red Silverstein) and over-protective Jake (Zak Henri). Both boys are in desperate need of a father figure, since their own dad, Mark (Joel McHale), only wants to be the fun dad. And only when it’s convenient for him. 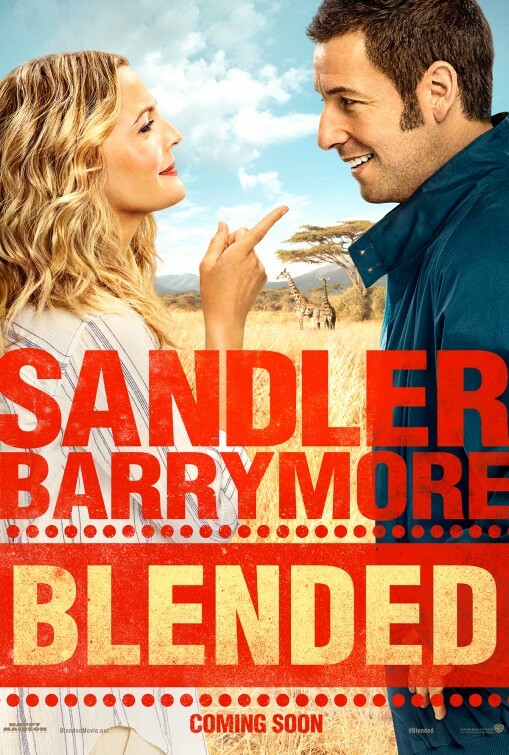 When Lauren’s best friend/business partner, Jen (Wendi McLendon-Covey) breaks up with her boyfriend, who also happens to be Jim’s boss, solely because he has kids, Lauren asks to take Jen’s spot on what was supposed to be a romantic trip to Africa, so her boys can have a proper vacation. At the same time, Jim learns that his boss’ girlfriend dumped him, and asks to take his spot on the same trip, unbeknownst to either of them. When Jim and Lauren learn they are booked for a romantic “Blended Family” weekend, at the resort, things don’t go exactly as expected. Trying to recapture the magic from 50 First Dates and the classic The Wedding Singer, Adam Sandler and Drew Barrymore team up for a third shot at a winning rom-com. While it doesn’t quite reach the heights of their first outing, Blended shows that the pair work well together. I don’t know how they do it, but Adam and Drew have great chemistry when they work together. The story is cute but predictable. You know exactly how the film is going to end. Unfortunately, it also feels a bit rushed sometimes. Parts of the story are hurried along, seeming as if they skipped a few scenes to keep things moving. Clocking in at just under 2 hours, I guess it’s excusable. Adam and the crew throw in just enough Sandler style humor to make it funny, without going overboard. Thankfully, he steers clear of giving us a Little Nicky or Jack and Jill type movie. Yet, he pays homage to several of his older movies, with subtle nods, if you’re watching closely. There’s a bull dance reference from Happy Gilmore and an “O’Doyle Rules” sign, from Billy Madison, among some others I probably missed on first viewing. Of course, being an Adam Sandler movie, it has all of his friends in it. Kevin Nealon makes an appearance as Kevin Nealon’s character in every Adam Sandler movie. He even adds a healthy dose of Sandlers to the mix. Noticeably missing, though, were Nick Swardson and Rob Schneider. (They weren’t missed in this movie.) The kids in the movie are probably happy knowing that as long as Adam keeps making movies, they will always have an acting career. My biggest complaint would probably be the misused Terry Crews. I don’t think he was as funny as the audience gave him credit for. His sole purpose in the movie is to pop up in “unexpected” locations with his singing crew, added musical commentary to every little scene. It always got a big laugh. I felt it was a little gimmicky. Overall, not a bad film, especially by Adam Sandler standards. I don’t know if it is a Memorial Day weekend caliber film, but it is two hours of mindless fun that you could probably take most of the family to see.